The last few years or so have seen a great deal of activity at St George's Church, Hanover Square, as the PCC has substantially re-furbished the historic interior and commissioned a brand new Richards, Fowkes & Co organ. Now there are plans afoot to remedy a significant lack in the church facilities, decent loos and somewhere casual for parishioners and concert goers to gather. Lack of space is a familiar reason why historic churches have difficulty fitting in facilities, but St George's has a secret weapon. 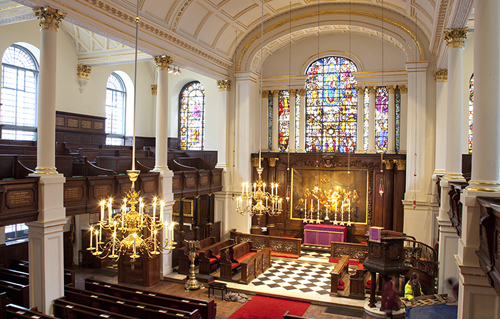 As Handel's parish church, St George's Hanover Square is the home to the London Handel Festival and, as concert goers and artists all know, the church's historic interior and fine acoustic are not matched by the back stage and front of house facilities. But when the church was built it was with a significant undercroft. Never, apparently, used for burials this may have been intended as a school but seems to have spent most of its life as storage, perhaps most memorably by a wine merchant. I visited the church recently when the parish administrator Stephen Wikner kindly took me down to the undercroft. There are still remains from previous existences, with the hoist for the wine, and brick partitions vaults. These latter are not structural and the plan is to remove them to reveal a handsome vaulted space. This will be multi-functional, with a commercial restaurant Monday to Friday, and availability for weddings at weekends. It will provide handsome facilities for concert goers, and a new meeting room (available for hire) which will double as a green room (no more using the church vestry). The undercroft extends into the area under the portico, and this will house the handsome new toilets. The existing toilets and access staircase are 20th century and can be stripped out to provide space for a fine staircase linking to the grand stair upstairs. Of course restaurants need kitchens and facilities, and these will be created by excavating the courtyard south of the church. When complete, the courtyard will return to use, providing external access to the new restaurant, as well as housing the new disable access lift (something that St George's sorely lacks). The undercroft plan is an imaginative solution to a tricky problem, and the restaurant should provide a welcome income stream for the church (which will be funding the changes partly using its own investments). Concert goers and artists at the London Handel Festival will certainly be grateful. The new undercroft development will also provide welcome facilities for those who attend St George's services. And perhaps the development will encourage more people to take advantage of the church's fine acoustic to mount concerts there.